I honestly never intended to take such a long break from blogging. It just happened and I kinda started enjoying the peace and quiet that came after the cooking process. I mean I enjoyed not rushing to catch the sun for good pictures, to arrange and wash the props and to be honest, I kinda liked the 'not cooking fancy dishes so i can show off on my blog' phase a whole lot that I pretended I didn't even have a food blog. In between I would whine to Ro about how I haven't updated the blog in over 10 days and he would be least bit bothered. It kinda rubbed off on me too, I must add. So when a whole lot of you guys wrote in asking if everything was fine, I was overwhelmed. The London Riots didn't affect us much, except for a day when all the nearby supermarkets and shops were shut, just as a precaution, which put me in a bit of a distress considering I plan on a day to day basis (not just grocery, everything in life really). But otherwise, the affected areas were no where near ours and so it was fine. Its all under control now and thank you so so much for writing in. Anyways, coming to the recipe...a couple of days back I was so lazy to cook that I decided to pick up one of those ready meals from the store. I would never learn from my mistakes, and so picked up Indian grub. Yes I bought Bombay Potatoes and pulao from a British grocery store. Did I think it would be authentic? I don't know, those Bombay potatoes looked so yum and I decided to just go ahead and buy it (without thinking, of course!). It tasted so horrid but I had to force it down my throat, because I had to "pay" for my actions. That's when I wondered, c'mon how difficult can it be to make these at home, and I did, today! Bombay potatoes are so damn popular here in UK, you can find it in almost all the grocery stores and heck Shwartz even has a spice mix called Bombay potatoes. 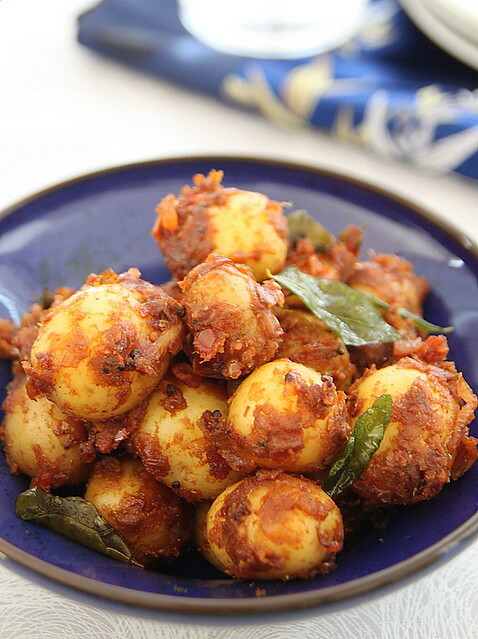 I wonder if there is actually something called Bombay Potatoes errr.. in Bombay? Or is it like the Chicken Manchurian which I presume originated in India and the Chinese have no idea about? Whatever the scene, I made it today and it was waaaay better than the store bought one. You can serve this hot or cold, and serve as a side to grilled chicken or Indian breads. Pre cook the potatoes till they are about fork tender. Not too mushy though. You can do this either in a microwave, pressure cooker (1 whistle) or on the stove top by boiling it in water. keep aside. Heat oil in a large wok and splutter the mustard seeds. Add the curry leaves at this point (if using) and stir for a couple of seconds. In goes the onions. Sauté till they are about light brown in colour, on medium heat. Add the ginger and garlic paste and continue to cook till the raw smell disappears, about 5 minutes or so on medium heat. Add the spices- coriander powder, chilli powder, cumin powder and turmeric powder- and mix well. Cook till they no longer smell raw, but nice and fragrant instead. Tip in the chopped tomato and stir well. Cook till oil starts separating. Add a wee bit of water if it starts scorching at the base. 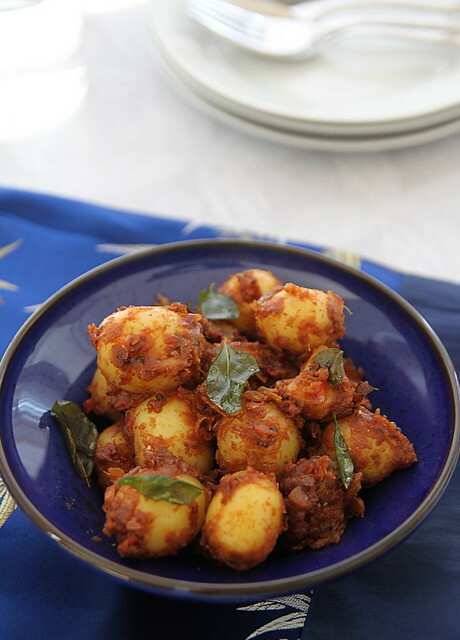 Add the cooked potatoes and mix them all together, making sure the masala coats the potatoes well. Increase the heat a bit and let it roast in the spices for a couple of minutes. Make sure you keep stirring in between. Sprinkle the garam masala on top, give it a good stir and after about 2 minutes, take them off the flame. Notes: You can do the same with large potatoes, just that pre cooking them might take a bit longer. You might also want to peel them in that case. Adjust the spice level if you are not up for it. Some versions have bell pepper, I didnt have any at hand, so omitted it. Feel free to add it along with the potatoes. I was really sad to hear about the riots in London which I considered one of the peaceful place to live. I was worried about my friends :( Luckily most of them were not affected by it and I am happy that you are one of them. Haven't heard of "Bombay" potatoes. I guess it is something like "Madras" curry powder. But it looks finger-licking good. Slurpp..
wow very tempting and nice spicy potatoes !! grt clicks !! looks like fried roasted eggs more than spicy,hot potatoes....slurr'p ! nice to have u back... bombay potatoes look lovely! they do look similar to dum aloo that we get here... but whatever they are called, they sure are yummy! Wow wat a tempting clicks,makes me hungry now...recipe is too gud. Glad to see you back..Never heard of the name Bombay Potatoes. Interesting! And the dish looks so spicy and good. Good to see ya back. And just about when I was thinking of writing again :) Wish I could do the same--enjoy food without thoughts of framing it and then cleaning all the messiness. But then, honestly, a peek into the plunging stats (in my case) would leave me too restless to enjoy the break, ah. Hey I checked out the link, didn't see your recipe in the list...? Happy to see u back safe and sound dear. Yummy spicy looking potatoes. Love em. Glad to see you back, Nisha..Bombay potatoes look absolutely yummy ..Gorgeous clicks! 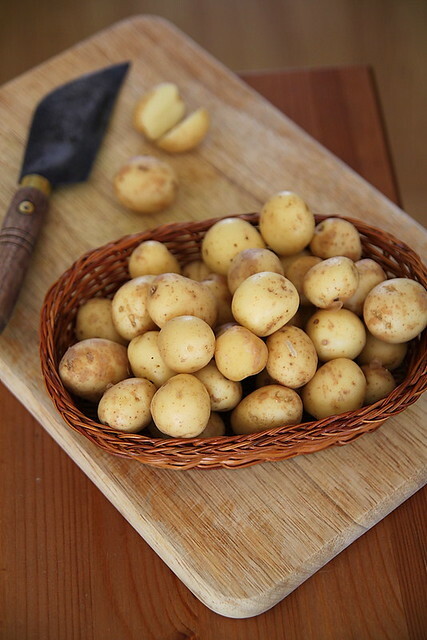 Enticing potatoes, makes me hungry..
everybody likes baby potatoes very much....that looks very taste! 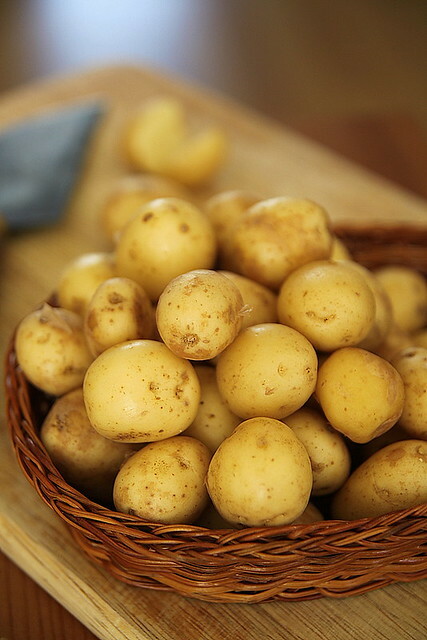 Hey glad to see u Back Nisha... potatoes looks absolutely gorgeous.. wish I can have a taste now. 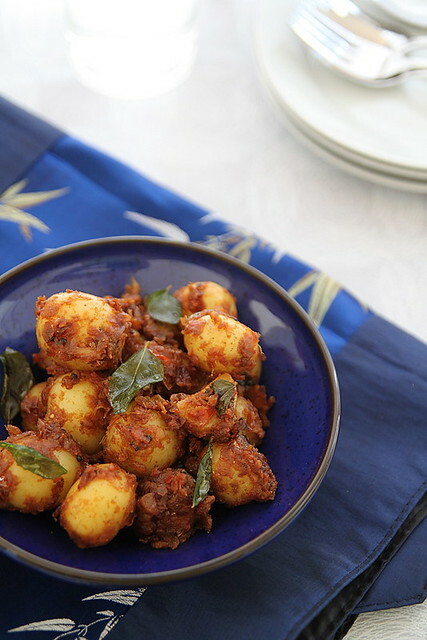 The recipe I use for dum aloo is very similar to this one only few ingredients are different like I use bay leave instead of curry leaves and whole garam masala to make the gravy. These are one of my favorites too. Love the clicks. Welcome back!! Absolutely love the spicy potatoes and the blue dish..stunning!! Very glad to see you back...I was worried when I heard about the riots in London. Thank you for sharing your words and pictures, my friend. I hope you have a wonderful day tomorrow. I'm enjoying your post with a big bowl of watermelon. Just perfect. Much love and many blessings from Austin! Glad to see you back girl! I hear you .. no prop cleaning .. no styling .. just cook and eat while it's still warm :) This potato dish looks delicious and guess what .. i made a similar dish, was about to post but now I think wait for a while ! Just voted, sweets. Good luck! I know exactly what you are talking about :)..a break is always good and i enjoy doing that a lot now :)...you don't have to cook before the sun goes down , can be lazy , lazy n lazy too...but Nisha , good to see you back..:)...love coming here , and reading you ;)..and pics are gorgeous gal!!! and..just voted for you gal!!! The potatoes are done just right like they were custom made for me... love the texture of the dish, spice combination and the amount of caramelization you got on the potatoes. Hey...these potatoes look really good. I think they're a little similar to Dum aloo, yea? Hi Nisha! I came here from Ananda's site - for the chicken dish, but I started to browse your beautiful blog and caught this post. What a beautiful food photography and I love this dish! 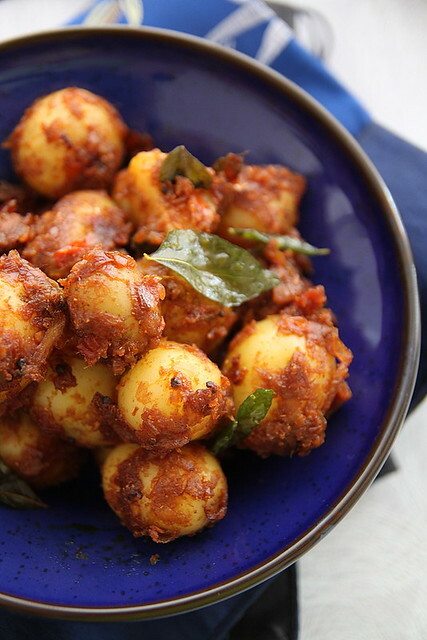 I can't eat too spicy but I love potatoes and this looks really good! I enjoy looking at your colors of photos especially.... I'm going to stay a little longer to browse around. 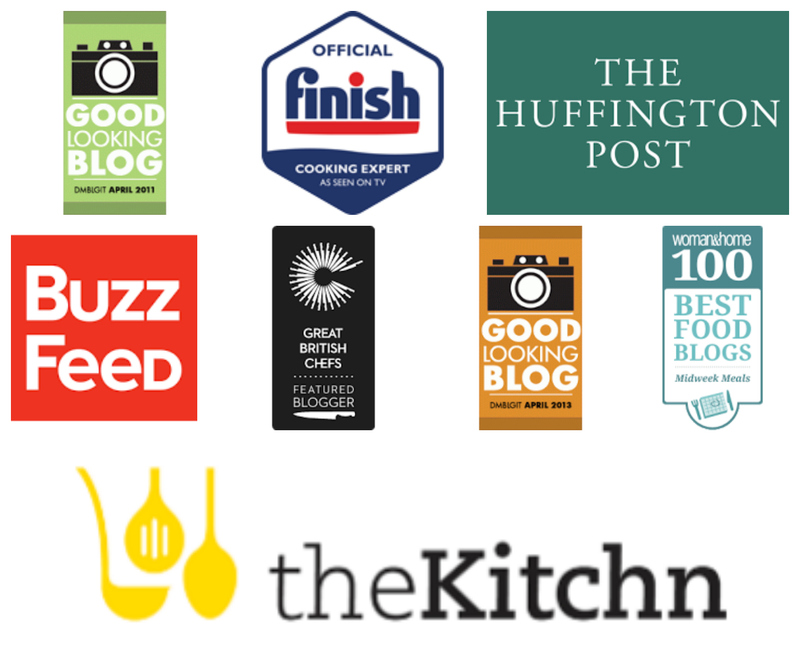 Just wanted to say I'm happy to find your blog! This dish looks absolutely lip smacking and wonderful pics to go with it. Wonderful idea, would have tasted yum. Feel like grabbing and having rite now,soo tempting. Great recipie! I added some natural yoghurt after cooking the toms. Gave it a little tang and made a nice gravy.